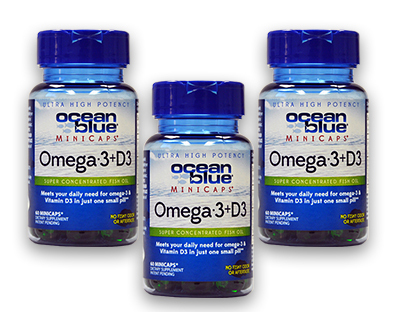 Ocean blue® Omega-3 + Vitamin D3 MiniCaps® is a super concentrated fish oil containing 350 mg of the most scientifically studied omega-3 components (EPA and DHA) which is 3.5 times more Omega-3 than regular krill oil. Its patent-pending molecular distilling process makes it one of the purest products on the market today. MiniCaps® are 1/3 of the size of the full-size softgels, making them easy to swallow. They also have a soothing, natural vanilla flavor so there isn’t any fishy odor or aftertaste. Ocean blue® Omega-3 + Vitamin D3 MiniCaps® meets your daily need for Omega-3 and 1,000 IU of Vitamin D3* in just one small pill.